She told me they had the wedding in a private villa in Ibiza with an amazing garden filled with Bougainville, roses and palmtrees, and under a 100 year old olive tree. The couple and their family styled the garden with paper lanterns and dreamcatchers made by their family. 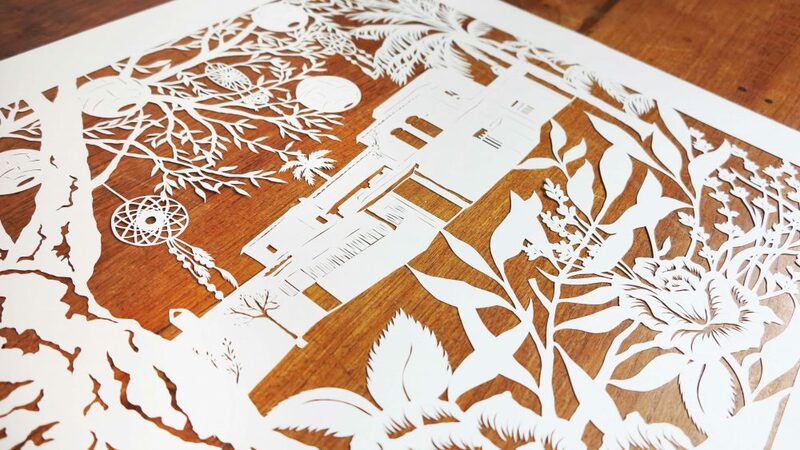 She would love to have this represented in the papercut, especially the olive tree needed to have a prominent place in the piece. Lavender needed to be featured as well, as this had a special meaning to them. To give me a better idea of the feel and look of the wedding she sent me lots of pictures of their wedding and all the decorations. As Chantal wanted the impressive olive tree to have a prominent place in the piece I made sure it was in the foreground. 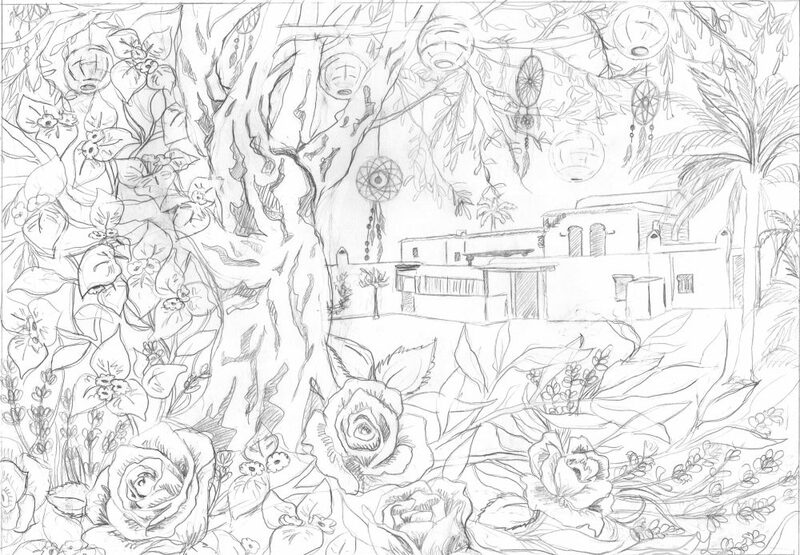 I decided to make the rest of the piece a little vista of the villa and the garden. For the romantic feel I added all the requested flowers. I personally like to vary the sizes of the flowers and give it a sort of “flow”. This makes the design look more interesting. As you see with this sketch, a drawing looks way different than the final papercut. Chantal was a bit worried in the beginning whether it would be a very busy piece, but after I explained the design a little, she was happy to go ahead. After approval of the design I started cutting the papercut. Especially the villa was a little tricky; with geometrical shapes like these, you see ever little flaw. Luckily it came out nicely and when I sent the piece over to Chantal (she didn’t want to see any pictures, but rather keep it a surprise), she was very happy! They did a beautiful job framing the piece and used the wood board that I use for shipping, as the backdrop (scroll down for a little picture of it). 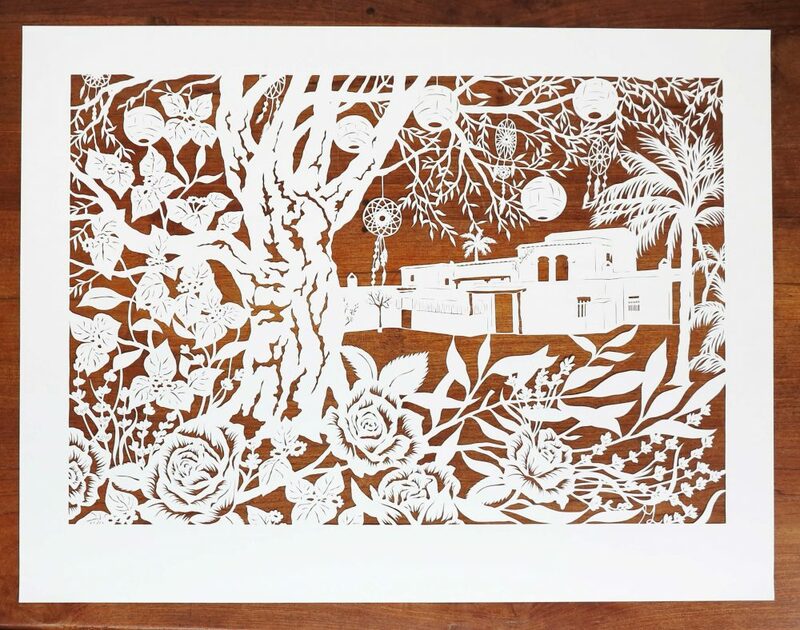 “We had a handcut paper art made for our wedding on Ibiza. In our mail conversations we sent wedding pictures for an impression of the atmosphere and explained which specific wishes we had. After this Marthe drew up an incredible design. In this design all details that were important in our special day, were incorporated. The design in itself was already amazing.